Saint Michael the Archangel isn't a saint, but rather he is an angel, and the leader of all angels and of the army of God. His title of "Archangel" means, that he is above all the others in rank. 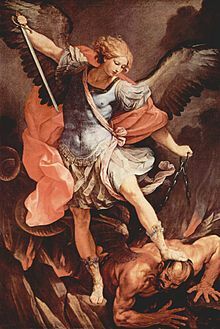 His next mention comes in the Epistle of St. Jude, where St. Michael is said to guard the tombs of Moses and Eve and has contended with Satan over the body of Moses. Today, St. Michel is the patron of soldiers, police and doctors.